JEGS 2 ton Hydraulic Utility Floor Jack is designed with precision hydraulics for steady lift and steel casters for longevity. Virtually every area is strengthened to give this tool the capacity to perform. It features a precision internal valve for even release and a specially designed hydraulic system to protect jack from overload or over pumping damage. This floor jack has an extra heavy gauge steel chassis frame and rotatable forged saddle for easy positioning. 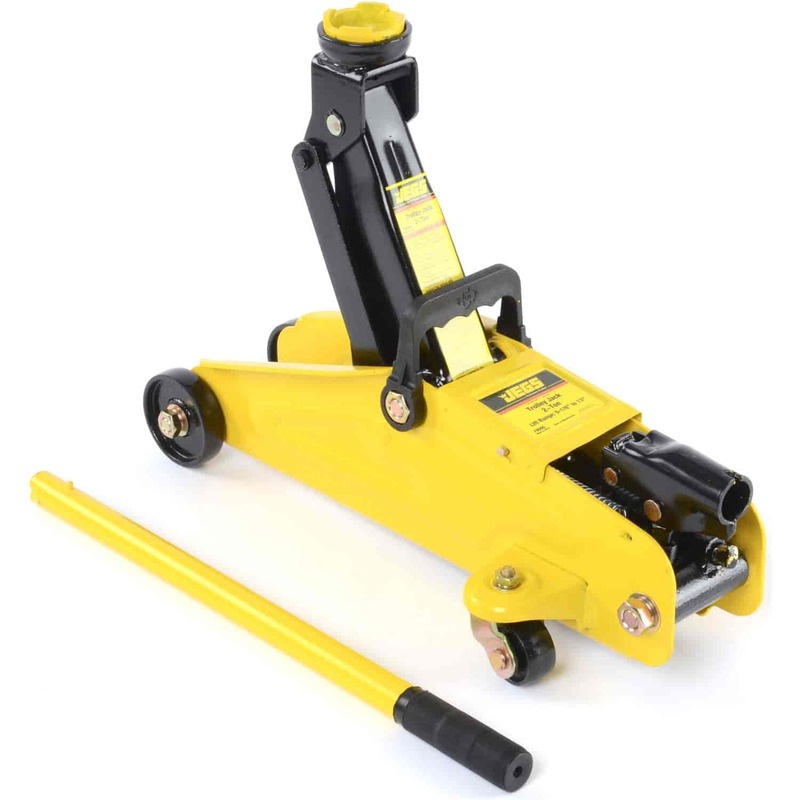 JEGS Heavy Duty Utility Floor Jack is constructed to ensure durability, power and smooth handling. 79000 is rated 3.0 out of 5 by 10. Rated 5 out of 5 by Tinatee67 from Great features I purchased this several months ago and I love it. Rated 5 out of 5 by Mattis from Perfect for the DIY Car Owner! I bought this jack to do a brake job on my car. It works worlds better than the OE Jack and is easier to use! The jack was packaged securely, the finish is great and most importantly, it lifts and lowers my vehicle with ease! Rated 1 out of 5 by tmc6720 from Do not buy this jack! This jack has no lifting capacity. It struggled to lift a Veloster and Charger, the handle is too short for adequate leverage, the frame is relatively tall and won't fit under low cars with the plastic handle attached, and the lifting cup is too small and slips off frame rail; I actually felt like it might drop the car before I got the jack stands in place. Rated 1 out of 5 by JustinY from Almost no power, hard to get tire off. I bought this to replace a scissor jack after I had a flat tire. I thought because it was JEGS it would be good quality. It is not. It has hardly any power, doesn't lift very high (I had a hard time lifting high enough to get my normal size tire off). The jack moved a lot also so it was very scary to use even with jack stands and wheel chocks. Rated 1 out of 5 by Gene1234 from Utility floor jack This jack must be for toy cars. Totally useless for standard size car. Too small handle too short no leverage etc. Very poor product. Is the lifting pad 'saddle' removable? Saddle pad is not removable.